More than one hundred number of two meters hight lanterns will be lined up in the central shopping street of Ureshino city. Varieties of hand-made lanterns and light-up ornaments will be decorated. On the weekend, there will be many events such as selling zenzai (Japanese sweet bowl of red beans) and tofu that is boiled with the water of hot springs, dancing performance, and meeting for the comedy theater and so on. Furthermore, the biggest event of this year is the “bed of catfish” which duplicates world of the god in Ureshino onsen called “Namazu-sama (catfish)” living in the riverbed with more than 200 lanterns. 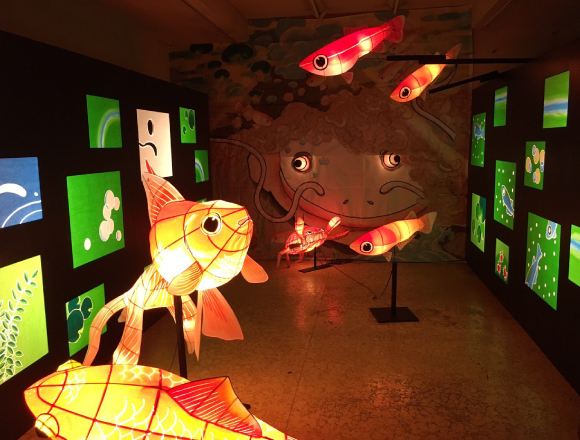 Five meters’ high catfish, killifishes and waterweed which was made by elementary and middle school students in this city will be decorated in the Gymnasium. Why don’t you go see the beautiful night view of the town in Nagasaki in this cold weather? Access：33 minutes’’ bus ride on JR Kyushu bus (Ureshino main line) from the South gate of JR Takeo Onsen train station and get off at the Ureshino Onsen Bus Center, 5 minutes’ walk from bus stop to the main place, Onsen Park. ■Related article：：Celebrate New Years’ with the Sanrio characters over at Sanrio Harmonyland’s “New Years’ Party 2017″!